Sergey Sirotkin qualified 18th and Lance Stroll 20th for the Bahrain Grand Prix. 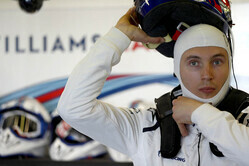 Both Sergey and Lance qualified on the supersoft Pirelli tyre. The session was disrupted by a red flag when the Red Bull of Verstappen went into the barriers. Sergey set a decent first lap-time, but was unable to improve on his second flying lap due to traffic. Lance made an improvement and found four tenths on his second timed-lap however it wasn't enough to progress into Q2. Paddy Lowe, Chief Technical Officer: That's not where we want to be starting the race but we weren't quick enough today for a number of reasons, some of them we understand, some of them we don't. We need to go away and do some more work. The race will be difficult from these grid positions but as always we'll do our very best as a team to see what we can achieve tomorrow. Sergey Sirotkin: I think we could have hoped for a bit more. The first lap I did was a really good lap. I don't think we could squeeze out any more from there. The second lap with the second set of tyres was strongly affected by a very messy outlap where I was fighting three or four cars for position. It was really messy preparation, I started the lap just behind a Sauber, and even then I knew the tyres and the brakes were not there. I almost managed to beat my previous lap-time, which shows we could potentially go another three or four tenths quicker, but I don't know if that would have moved us any further ahead. I think, compared to Melbourne, we actually did a better job, in some terms we maximised the performance of the car. We are moving ahead in one area, but we are missing something. I'm happy because we're moving ahead and we are not making the same mistakes as we were in Melbourne. We didn't see it in the results, but for sure the way we are working is better and personally I'm happy with that. Lance Stroll: It has been a really hard weekend. It was disappointing for the team with both cars out in Q1 and it was not ideal. A lot of things are wrong. The balance isn't there, the grip is not high enough and we need more speed, so we need everything to go quicker. Last year in qualifying, my lap was four tenths better than it was today. In the race, I hope we can go forward, but we don't have the package today to compete where we want to compete. Check out our Saturday gallery from Bahrain, here.